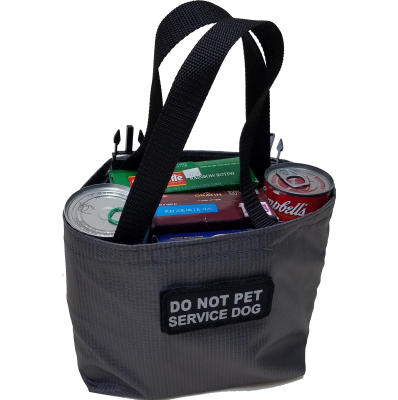 This is a replacement bag for the Service Dog Grocery Getter Harness. The bag has expanding sides when holding groceries. There are tuck away handles to carry the bag and hook & loop closing interior flaps on the inside of the bag. This bag fits secure on the harness by two side release buckles and hook & loop. It is important when the dog is carrying the groceries that you evenly load the weight between the two side bags. This will make the dog's job easier and the bags will feel firmer on the dog when walking.